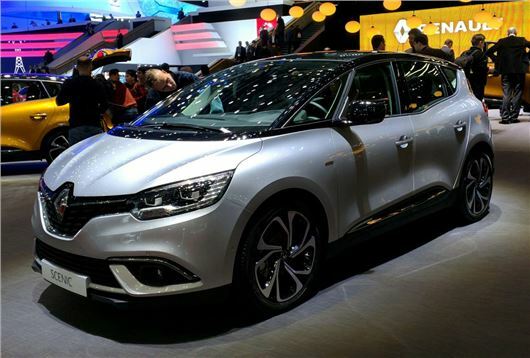 The new Renault Scenic has been launched at the Geneva Motor Show. The MPV gets a rugged, crossover look compared to previous Scenics, with a raised ride height and 20-inch wheels as standard. It will go on sale in the UK this autumn with prices expected to start at £20,000. As well as a pumped up look, the Renault Scenic gets significant improvements in quality, with more soft touch plastics and a classier finish, with better fit and finish, along with an upright 8.7-inch touchscreen in the central dash. That said, the Scenic remains true to its friendly-friendly values, with a 572 litre boot and a one touch seat folding system, operated by a tap on the infotainment screen or by activating a switch in the boot. The front passenger seat can also be doubled up as a small table and there will be 63 litres of additional storage, with large cubby holes and a 11.5 litre glovebox. There will also be two USB ports, allowing electronic devices to be charged while on the move. As before - there will be the standard five-seat Scenic and a seven-seat Grand Scenic and but both will come with the same versatile seating system as before along with plenty of clever storage areas. There will be up to six diesels and two petrol engines to choose from, with power outputs ranging from 95PS to 160PS. Most powertrains will be mated to a six-speed manual, although a six-speed and seven-speed autos will also be available, along a hybrid option. There are no fuel economy figures or CO2 ratings yet, but Renault says it will confirm these prior to the Scenic going on sale in the UK in the autumn.